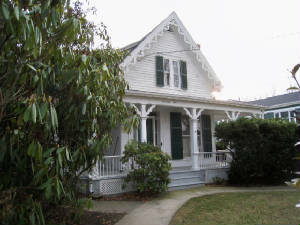 Examples of Carpenter Gothic style Victorian houses on Groton Bank. Captain Miner sailed packet ships, a major form of coastal transportation. 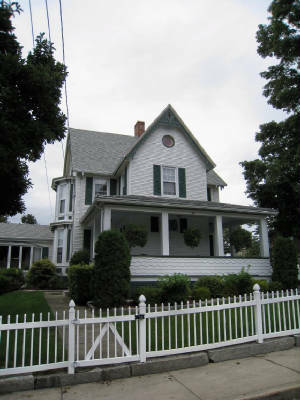 Typical of the Gothic style, the house has a steeply pitched roof with elaborate scrollwork bargeboards on the eaves. Another example is the Seabury Memorial Church, 1875, named in honor of Groton-born Rev. Samuel Seabury, first American to be consecrated as a protestant Episcopal bishop. Today it is an Islamic center. (No photo).